Breakfast is, by far, my favorite meal of the day. If I didn’t have to rush out the door each morning for work, I’d take the time to prepare poached eggs, migas or cinnamon french toast with strawberries (paired with a coconut milk cappuccino or mimosa, of course!). 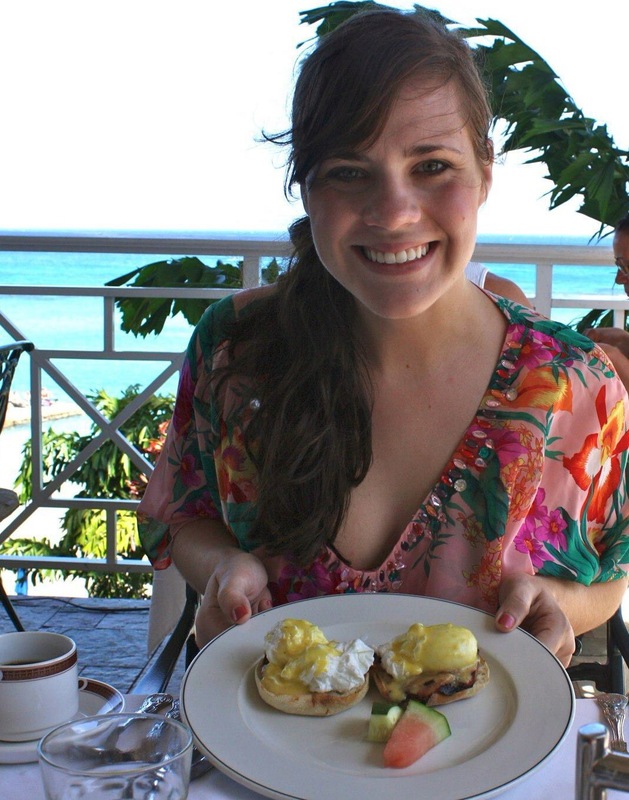 Getting to enjoy breakfast is one of my favorite parts of vacation and the weekends. But reality is most of us just don’t have time for that. Most of you, I can imagine, skip breakfast altogether most mornings. I’m sure you’ve heard it time and again, but breakfast really is the most important meal of the day. It jump starts your metabolism, gives you energy, and prevents the hunger that puts you in a bad mood or causes you to overeat later in the day. Plus, a healthy breakfast gives your body the best chance of absorbing those vitamins and minerals more easily at the start of the day, cutting down on your cravings later. 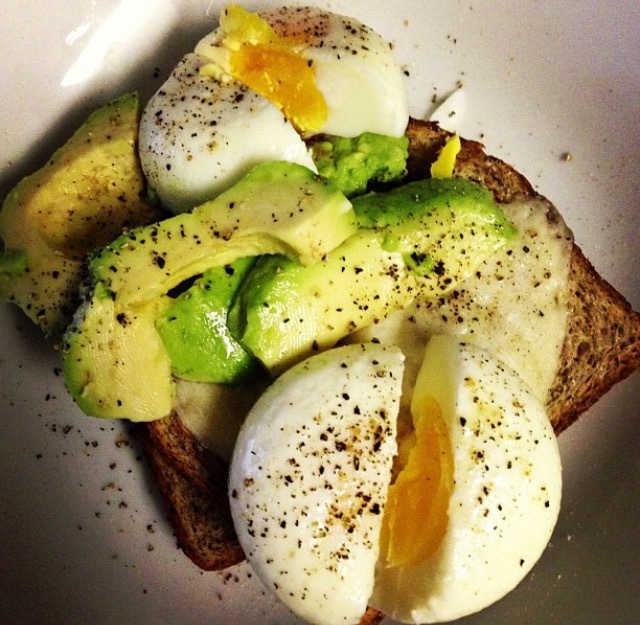 If you have an egg poaching pan, this option is as fast and easy as boiling an egg. While the eggs are cooking, I toast a piece of sprouted wheat bread (read why here), slather with organic butter or coconut oil and then top with sliced avocado. It takes me about 7 minutes total to throw together this delicious, filling meal. On a side note, I always make sure to buy free-range, organic, soy-free eggs because they are the most nutrient-dense. I get this local brand at Whole Foods/Natural Grocers and love them; you truly can taste the freshness: Coyote Creek Farms. I originally found this recipe on one of my favorite health blogs, Wellness Mama, and I love its versatility. It is so incredibly easy to mix up a batch and throw in whatever extra vegetables are in your fridge. Also, bacon! I will make these on Sunday night for the week. I usually eat a couple of these at a time – wrap them in foil and warm a few minutes in the toaster oven, then eat them in the car. If you want to nix the bacon for whatever crazy reason, you can also just whip up some eggs, throw in some diced veggies and bake in muffin tins for mini frittatas. This is another one of those easy make-ahead options that you can put in a container to grab on your way out the door. Simply boil a couple of eggs (can’t boil an egg? try this! ), throw in a few berries for an antioxidant boost and then I add a muffin or two that I’ve baked on Sunday. This gluten-free banana muffin is one of my favorite & totally healthy recipes – you can add in a couple tablespoons raw honey if you like it sweeter or some dark chocolate chips and nuts for some texture. Greek Yogurt is a yummy way to get some great protein in the AM with 15 g in 1 cup. 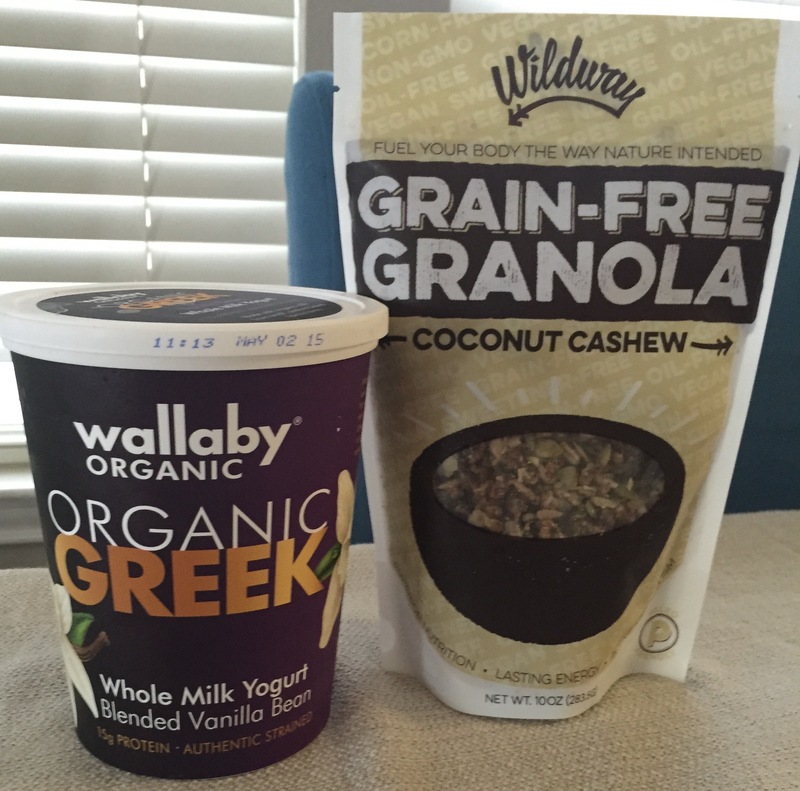 I personally love the Wallaby brand made with organic whole milk from pasture-raised cows and no artificial ingredients. Then, I top with some grain-free granola and fresh berries. I recently found this Wildway Granola at Whole Foods and fell in love… it’s not cheap but it’s packed with fiber & protein (8g), is completely raw, has no added sweeteners. It is made entirely of fruit, nuts, and seeds, so is gluten-free, paleo and truly the healthiest pre-made version of granola you can buy. P.S. I also love this as a late night protein snack to help me fall asleep. If you want an option with zero prep, try these tasty, wholesome breakfast bars. My favorite is the Peanut Butter Chocolate Chip with 12 grams of protein. I love this brand because they are organic, GMO-free, soy free (try finding another protein bar that is, especially with chocolate), free of refined sugar AND are reasonably priced compared to other options. The whole mission of GoMacro is to provide a “macrobiotic” or minimally processed, found-in-nature product. You can buy them individually or by the case for a discount at Whole Foods or Natural Grocers. 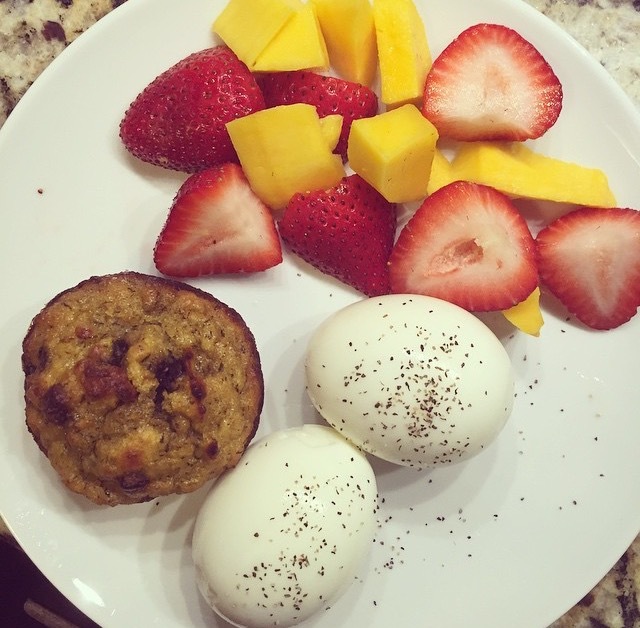 Any other healthy breakfast ideas? Please share – I am always looking to mix it up!